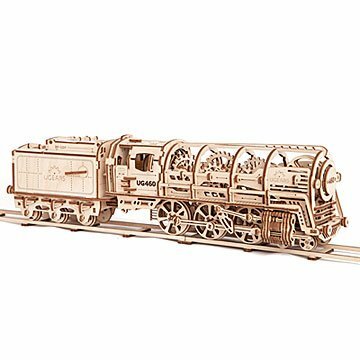 Explore the inner workings of a steam engine as you make this functioning wooden model. Are you someone who enjoys learning how each piece works together perfectly to make a machine work? Build your own working model of a 19th century locomotive with this extraordinary DIY kit. Beautifully designed with an eye for detail, the wooden pieces are easily popped out from sheets of pre-cut plywood and can be assembled without nails or glue. Instead of steam, the model is powered by a rubber band, but the working of its engine, including an asynchronously operating piston and valve mechanism, are clearly visible. There is even a retractable ladder under the cabin doors, which open to give you a peek inside. After it's assembled, you can have fun watching it go chugging across the floor or desktop, or simply put it out on display and enjoy a sense of pride and accomplishment in having made it yourself. Made in Ukraine. My father said it was a challenge. You do have to be very careful with the pieces. He was worried he was going to break some, but never did. This kept him busy for about 3 weeks. He could only do a few hours at a time. My husband is excited to put this train together with our children.